Wow. You know, once upon a time, major record labels actually took chances with bands instead of just trying to move units of product. In the late 70s-early 80s, bands like Can and Pere Ubu and hell, even the Shaggs actually got fairly decent money and eventually recognition for their originality and experimentation. 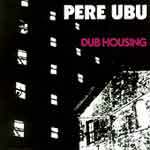 Upon listening to "Dub Housing" for the first time in years, I can only wonder if this would get signed to a label as big as Chrysalis today. Which is too bad, because even 21 years after its original release, this is so freakishly contemporary, and seems wholly original and experimental even today. The songs are loaded with non-traditional rock instruments (sax, violin, who knows what else), dissonance, changing time signatures, etc., and all seem just about to fall apart without ever actually doing so. Even Dave Thomas' inability to actually carry a tune doesn't damage these songs any, and in fact just makes them all the more appealing, and gosh, even endearing.